Completed tonnage from Chinese shipbuilders continued to show growth between January and May 2017. However, the orderbook has shown a year-on-year fall and a decline in the main economic indicators from major companies indicated a slowdown, according to the statistics from China Association of National Shipbuilding Industry (CANSI). 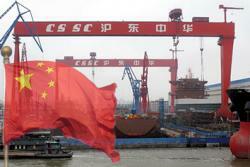 It means that China’s shipbuilding industry still faces a rather severe challenge. However, CANSI’s China Shipbuilding Capacity Utilization Index (CCI) suggests that China’s shipbuilding capacity utilisation rate has actually been gradually increasing since the end of last year. From January to May, the national shipbuilding completion stood at 22.93m dwt, an increase of 78.8% year-on-year; new Chinese orders had reached 9.86m dwt, down 31.5% and, as of the end of May, the orderbook was 85.15m dwt, down 30.7% from last May and a fall of 14.5% from the end of 2016. In the same period, for exported vessels, the completion tonnage was 21.57m dwt, an increase of 82.2% year-on-year; new orders had reached 8.83m dwt, down 35% and, at the end of May, the on-book orders were 78.85m dwt, down 32.4% from last May. Export ships accounted for 94.1%, 89.6% and 92.6% of the national total in completion, new orders and orderbook, respectively. From January to May, 53 key shipyards under monitoring completed 19.57m dwt, up 63.5% year-on-year whereas their new ship orders were 8.74m dwt, down 37% and, at the end of May, their on-book orders were 80.61m dwt, down 31.6% year-on-year. From January to May, the same 53 shipyards completed export ships totalling 18.59m dwt, up 67% year-on-year, whereas their new export ship orders were 7.87m dwt, down 40.3% and, at the end of May, the orderbook was 74.97m dwt, down 33.7% year-on-year. Export ships account for 95%, 90.1% and 93% of the total for these shipyards in completion, new orders and on-book orders, respectively. From January to May, industrial output from the 80 key enterprises in shipbuilding sector under monitoring fell 7.7% year-on-year. Among them, the shipbuilding output fell 11.6%, supporting service output fell 19.4% and shiprepair output fell 1.2%. During the same period, the ship export output from the 80 key enterprises in shipbuilding sector under monitoring fell 10.8% year-on-year. Among them, the shipbuilding output fell 12.1%, supporting service output fell 20.6% and shiprepair output fell 4%. Their core business turnover fell 7.2% year-on-year and total profits dropped by 6.3%. At the end of 2016, CANSI released its China Shipbuilding Capacity Utilisation Index (CCI). This is the primary index released by China’s shipbuilding industry to reflect the extent of China shipbuilding capacity utilisation and to forecast future industry trends. In the third quarter of 2016, CCI was at 607 points. According to the latest data released by CANSI in early April this year, CCI in the first quarter of 2017 was at 670 points, a 61 point increase (or 10%) quarterly growth, compared to 609 points in the fourth quarter of 2016. The index shows some signs of stabilising, but it is still in the cooling state. The analysis of CANSI shows that, in the first quarter for 2017, due to the influence of the continued warming up in the shipping market, the capacity utilisation of the major shipbuilding enterprises continued to rise and shipbuilding completion saw a large increase, thus the index rose markedly. CANSI expects that, in the second quarter of 2017, it will be difficult for the fleet and shipbuilding overcapacity situation to improve significantly. Conditions will make it tough for the market to continue to rebound, thus a challenge for any significant improvement in business, and the orderbook will continue to decline. Therefore, the China Shipbuilding Capacity Utilisation Index will be comparable with that of the first quarter and the overall trend will remain in a cooling state.